As many of you who follow me know I love a small bird in the frame that really shows off their habitat and this one worked really well for me. 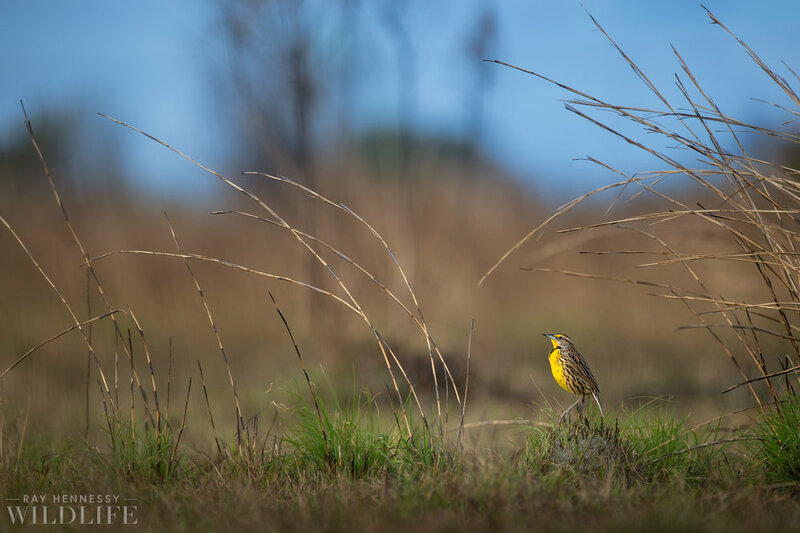 My sister and I were out photographing these lovely Eastern Meadowlarks in some open field habitat when we began working with this one. It was hanging out in a clear area that looked like a controlled burn within the recent past, which is why all the tall stalks of brown grass are all charred and the fresh green grasses really stand out. It's a really unique habitat that these birds seem to really enjoy. This bird would run around from spot to spot and find a small hill to stand on to really get a good look around. When it walked up on this small hill I was saying out loud "don't move, don't move" wishing the bird would stay put so I could get in position and get a ground level perspective. The bird obliged and I got the shot I was after. Location: Sebastian Sebastian River Preserve State Park in Sebastian, Florida.